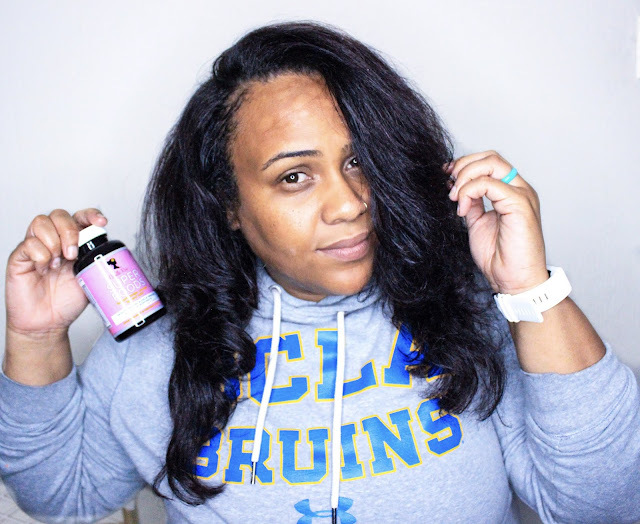 The Mane Objective: Do Camille Rose Naturals' Super Foods Vitamins Actually Work? I took these vitamins every day for 3 months to find out. Since late January, I've been faithfully, dutifully, and carefully taking the Camille Rose Naturals Super Foods Vitamins. 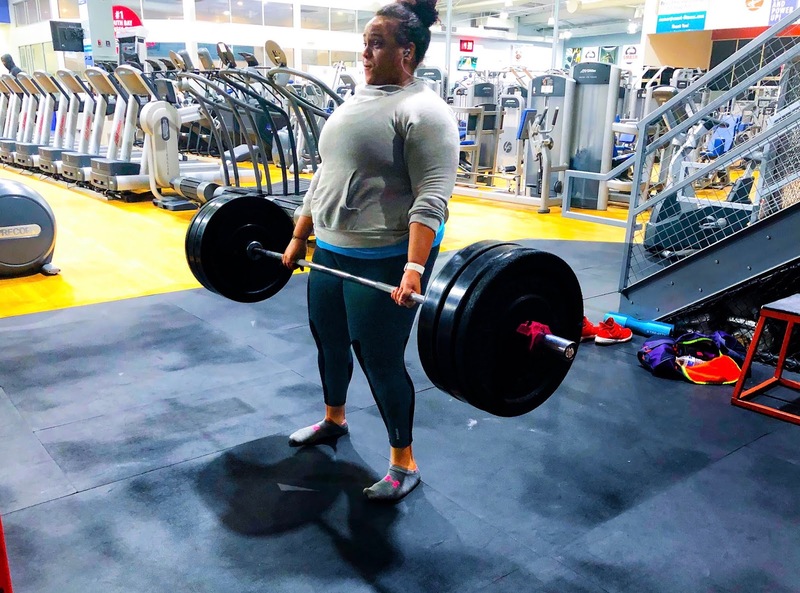 I've been documenting my growth, alongside my fitness journey and there's only one question left to be answered - do the vitamins actually work? Yes, yes, yes, and more yes. Let's dig into why - starting with what my initial goals were when I embarked on this challenge in January. Starting on January 15th, 2018 I committed to taking the Camille Rose Naturals #BestSelf Challenge with the new Super Foods vitamin. Click here to catch up and read my intro blog post, month 1 and month 2 check-ins! 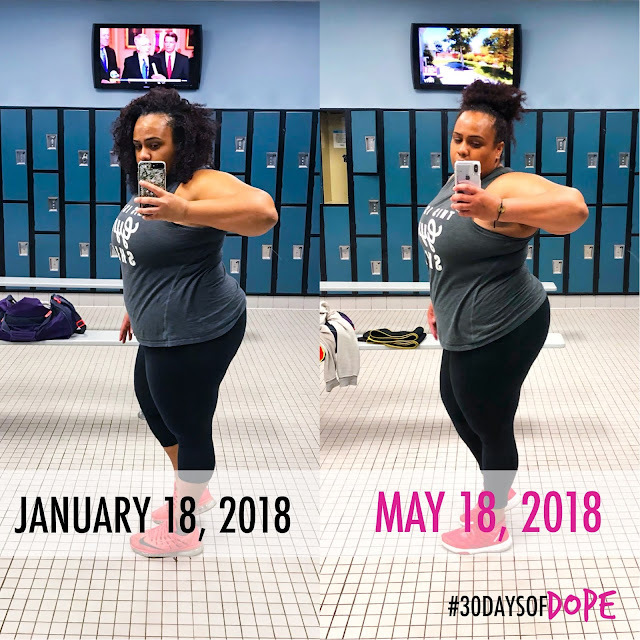 As we sit here in May, a few weeks out from the last day of the challenge, I'm feeling good and great about my hair, skin, and fitness journey! I took my Super Foods vitamins daily, without fail. Sometimes, it was an ::oh crap:: right before bed, other times it was while at work. But I took it! I'm happy to report that while during the #BestSelf Challenge, I stuck to my guns for the most part. I feel like it was about an 80/20 or 75/25 as far as adherence to my macros was concerned. I definitely chilled out on a lot of carbs (with a few exceptions... I'm a work in progress lol) - but I feel like I have a firmer grasp on nutrition. I'm learning to eat for fueling my fitness goals, not just because I want something. Trust me - there were a lot of days I begrudgingly ate grilled chicken and broccoli, wishing it was an enchilada with rice and beans from El Sombrero. There were even more days I wished my Fit Crunch protein bar would morph into a cupcake. But discipline and building better habits is something I'm committed to for 2018. I don't utterly deprive myself of the things I enjoy, I'm just working to better incorporate them into my macros. Weekends are hard, and sometimes I completely blow it. But I'm learning how to get back on track after setbacks, and that's something I'm proud of. After all, this is a marathon. Of everything, drinking water and working out are the easiest. As I mentioned in my 2 month check-in, I'm working out at 4am on the regular now. In fact, we've pushed back the time a little. Samuel and I used to wake up at 4am, but it left too small of a time frame to fully work out and still get to work on time (for him). So we pushed back to 3:00am. We're usually out of the house by 3:40, and in the gym before 4am. This leaves us a solid hour and a half or more to get through our workouts. 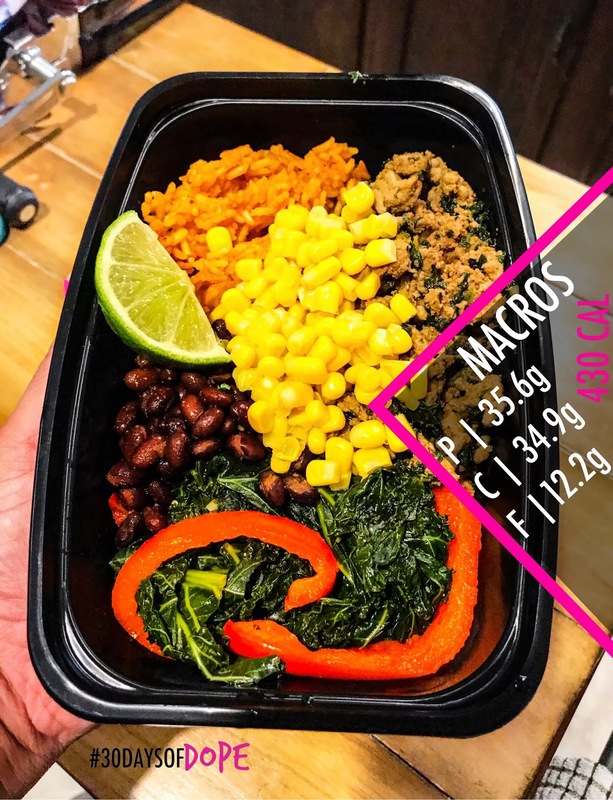 Need more meal prep inspo? Follow @30daysofdope! I definitely feel like the #BestSelf Challenge pushed me to another level of accountability to myself. And for that, I'm grateful. If you're interested in a definitive list of pros and cons, click here for last month's check-in. What I'm sharing below is an overall review of the Super Foods vitamin - similar to how I break down hair product reviews. $18.00 for a 30 day supply (60 vitamins total). Super Foods can be purchased at Target and on the Camille Rose Naturals Website. They're also available on Amazon. Not gonna lie, decoding vitamin and supplement labels can be difficult. Some brands use "proprietary" formulas, and don't disclose the exact amount of each ingredient - just the "blend". 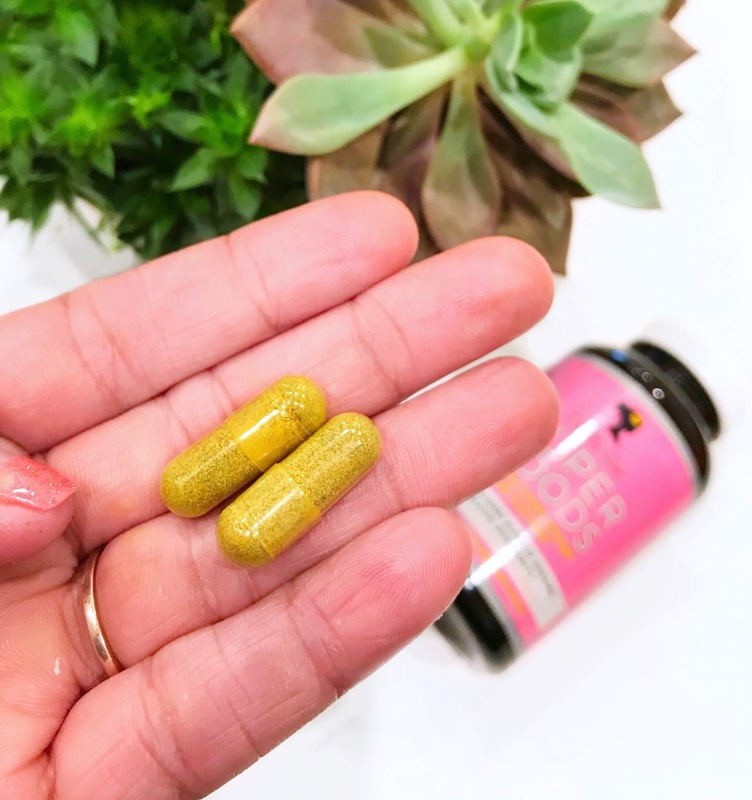 Luckily, Camille Rose Naturals breaks it all the way down with Super Foods - letting you know exactly how many milligrams or micrograms of each ingredient you're getting. Biotin (138mcg / 460%): Beneficial for improving rate of hair growth, nail growth, and boosting metabolism. Vitamin B1/Thiamine HCI (5mg / 417%), Vitamin B2/Riboflavin (5mg / 385%), Vitamin B6/Pyridoxine HCI (5mg / 294%): Part of the B-Complex vitamin group. Beneficial for hair growth, while aiding in proper food metabolism for energy and hair growth. 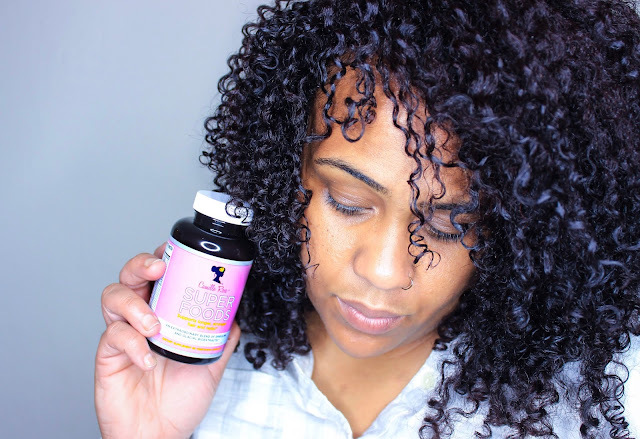 B-Complex vitamins are also great for managing neurological stress, and can help counteract the potential for breakouts with heavier doses of biotin. Calcium D-Pantothenate (20mg / 400%): Also known as Vitamin B-5, which helps generate energy from food. Vitamin E (20mg / 133%): Vitamin E is an antioxidant powerhouse that contributes greatly to preventing damage and restoring youth and vitality to the hair and skin. Spirulina Powder (125mg), Alfalfa Powder (50mg), Organic Kelp Powder (50mg): This green trio helps to slow down and reverse the signs of aging in the hair while promoting growth. MSM (50mg): While mainly used to improve joint health and fight inflammation, MSM has also been shown to lengthen the growing phase of the hair. Hydrolyzed Collagen (50mg): Collagen is essential for healthy hair and skin, and depletes as we age. 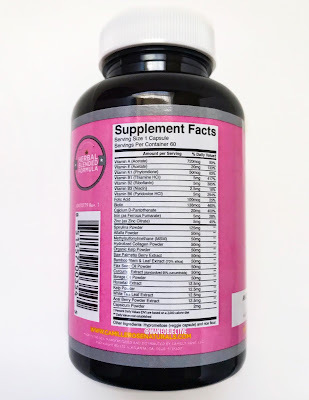 Hydrolyzed collagen helps to slow hair loss, while thickening hair that is thinning, strengthening nail beds, and even helping build lean muscle to promote fat loss. Saw Palmetto Berry Extract (50mg): Touted for potential DHT-blocking capabilities and preventing hair loss/alopecia in women and men. Bamboo Stem & Leaf Extract (70% silica, 50mg): Silica-rich extract that is key for hair and skin health. Bamboo extract contains 70% silica, which is a building block of healthy hair, and aids in collagen production. Learn more about why your body needs collagen by clicking here! Along with a variety of other extracts and herbs, including capsaicin (which has a slight thermogenic effect on the body, potentially aiding in fat burning) - it's safe to say that Camille Rose Naturals was very intentional in packing the Super Foods vitamin with lots of good stuff. I love that as a brand, Camille Rose Naturals takes a holistic approach to hair health - recognizing that a healthy body produces healthy hair. This is largely (if not totally) due to the influence of CRN's founder and master mixtress, Janell Stephens. Janell regularly shares snippets of her healthy lifestyle on IG which is super inspiring, and lets me know that as a brand, Camille Rose Naturals walks it like they talk it. Just two capsules per day! It also excites he that the concentrations of things like biotin and B-Complex were high, but not astronomical. A lot of supplements give you like 1 or 2 thousand percent of your recommended daily intake - which is a bit overboard and a waste. Biotin, like the other B Vitamins are water-soluble, meaning your body basically pees out what you don't use. I mean, even if you eat Mc Donald's for a living, there's no way your body needs 1500% biotin every day. That's low-key a waste of money. I like that Super Foods keeps it reasonable and cute, ensuring that most of what's in the vitamin will get put to use by your body. My results REALLY took off once I got the dosage right! No breakouts. No jitters. No crashes. No weird reactions. No upset stomach. I can take these babies with food, without food, right before bed, first thing in the morning - and no adverse reactions. That makes them incredibly convenient. Lastly, and most majorly - they WORK! My eyebrows flourished. My hair grew like crazy, especially once I realized after month 1 that the dosage was 2 per day, and not 1. My nails grew like crazy too - but I didn't have time to take care of them. My nails have always been thin and weak, and don't survive without a gel mani. I didn't have the time to commit to doing it myself, or going to a shop weekly, so I just kept clipping them off. I was less concerned about my nails, and more concerned about my hair. My hair is healthy, full, and has completely bounced back from the hair color damage and disasters of yesteryear. I know a lot of brands are getting innovative with their vitamin delivery systems. With everything from dummies and liquid shots to flavored drink powder, pill form seems basic. It doesn't bother me though. As someone who regularly takes vitamins, I'll easily knock back two pills per day. If you can't swallow pills or don't like to, you can try breaking the capsules open and blending them into a smoothie. I just don't know how that would taste. If you're making a commitment to total wellness, and want a supplement that's going to help bolster your hair and nail growth while steering you in a healthy direction overall - Super Foods is for you. It's important to note that no pill, no magic wrap, and no tea is going to give you the instant results you want for your hair and your body. They are to be used to supplement what you're already doing. You can't not eat vegetables and take Super Foods thinking you're gonna be all good. It doesn't work like that. Don't worry, I finally got my lifting shoes! If you're working toward eating better, moving your body, and drinking water - then you're going to get the most out of Super Foods. Absolutely. In fact, I'm planning to head to Target this weekend and stock up on another 2-3 month supply. I want to keep this momentum growing, I mean, going! I just flat ironed my hair right before writing this post, and even after two trims, I feel like my hair has either reached or surpassed the 2014 length goals I set for myself. EDIT: I wrote this post before my Target trip. I'm now the proud owner of FIVE bottles of Camille Rose Naturals Super Foods. 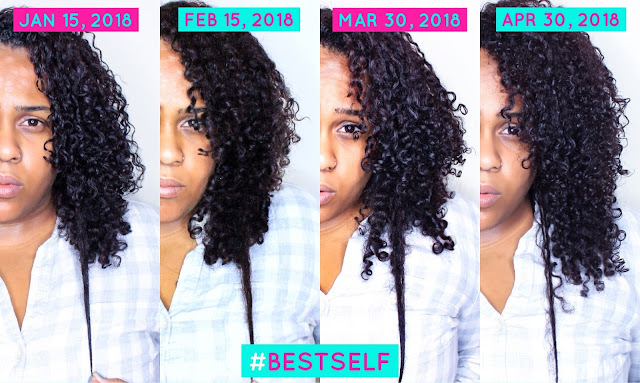 After the #BestSelf Challenge ended, I gave myself two trims - one on my curly hair, and another while flat ironed. Even still, ya girl got LENF! Health is always the #1 priority. Well, that's all there is to it! Got any questions about Camille Rose Naturals Super Foods vitamins? Drop 'em in the comments below! Did you experience any undesirable hair growth elsewhere? I worry about rapid facial hair growth.